Photo courtesy of Knoll, Inc. Socialization, digitalization, “connectorization,” densification, standardization, rationalization, realization, & monetization.Some say the driver for the huddle room is the coming of age of Millennials—the tech-savvy cohort born between the early 1980s and 2000—who are entering the workforce in record numbers. There is no doubt that they are active, socially engaged, and were born with a digital spoon. To meet the needs and expectations of this unique contingent, corporate offices and higher education campuses are being redesigned with open spaces, collaborative environments, and huddle spaces. Talk to a CFO with offices located in New York, London, Singapore, or many other major metropolitan areas around the world, and the discussion is a lot less cozy. It’s driven by the bottom-line. Skyrocketing real-estate prices have effectively broken down the walls of personal offices, and decreased the amount of square footage of office space per employee leaving architectural designers, facility and HR managers, department heads, technology teams and many more to figure out how to keep the peace, while increasing harmony and productivity. Whether it was the chicken or the golden egg that drove the huddle space trend, 2016 holds the promise of refining these spaces based on understanding human behavior, spatial considerations, technology needs, and measuring the ROI—in other words, true harmony. Employees waste a lot of time trying to locate an open meeting room; this is exacerbated by the decreased ratio of private offices per employee. Integrating huddle spaces into an overall room scheduling system that can be accessed from the desktop or mobile device via an app will not only save time, but increase satisfaction. Where possible, Vorhes encourages users to think about huddle spaces as “transitional spaces.” They will change as technology changes. Bandwidth demands are increasing and as a result we see increasing Internet download speeds to the end-user. Hardware and software companies are taking advantage of that additional capacity by constantly innovating in this space. When possible, think about future needs and plan your infrastructure purchases to meet them. The goal of a huddle space is to make it easy for the user, but that comes with caution. Here are a few tips and considerations. Does the user need to be connected to the network? The safest scenario is a wired connection using HDMI or VGA from the PC to the display, and completely off the network. On the network? Then validate: Ask the AV manufacturer if the gear intended for the huddle space has enterprise-grade security features. Treat the networked AV device the same as an IT product, otherwise it creates a potential vulnerability. If the AV presentation device is to be managed by software, and tracking utilization, it will need to be on a network. An option is to incorporate a VLAN and isolate the networked AV equipment in various spaces away from the rest of the network. In this scenario users won’t be able to access data off the corporate network. Tiered Access: Huddle spaces that are closer to the office entrance might be designated with guest Wi-Fi, and not connected to the company network. As huddle spaces move further into the environment, that’s when each type of space might be granted different levels of network access. Facing reality: A pixel perfect experience is less important than the security of the enterprise network. As the design and use of huddle spaces has evolved from tossing any display on the wall, a Wi-Fi connection and a couple of chairs in a room, Middle Atlantic Products director of Product Management Tim Troast, suggested some general rules to keep in mind. ● Provide secure wired and wireless connections and reliable support w/ proper power and thermal management. ● Locate in-the-table support system, under the work surface, or in the wall. ● Fewer rack units required, if at all. Sereno includes an ultra-wide field of view to allow everyone sitting in just about any sized room, large or small, to be easily seen on the other end of the conference. Additionally a swivel mount was integrated to allow the camera to easily be angled towards any one area of the room. To safeguard meeting room privacy, Sereno features mechanical video and audio shutters to protect what can be seen and heard in a meeting room. Biamp Systems Oreno Suite control solution provides greater ease-of-use, deployment simplicity, and the ability to control any Biamp Tesira-equipped conference room via mobile devices. Ideal for standalone or multiroom conference settings using Tesira or TesiraFORTÉ, the Oreno suite allows participants to lock access to specific conference rooms during a meeting, place calls, and recall presets from Web-enabled devices. To expedite the creation of the user interface, the Oreno Creator tool provides a simple UI builder, which uses drag-and-drop tools and pre-built templates allowing for end-user customization. The Oreno Manager allows control to be passed to the end-user. Deployed onsite on a Windows PC or virtual machine, Oreno Manager provides systems administration tools and network management capabilities. Running in the browser of Web-enabled devices, the Oreno UI provides complete mobile control of a room’s audio functions without the need for any software to be installed on the user’s personal device. Black Box Suit of Wireless Presentation Products simplifies wireless presentation, and improves collaboration. With high-performance wireless presentation tools from Black Box, you get super versatility, easy setup and management, security, and more. Benefits include: Improve collaboration: several users can access the system at once, making it a great system for conference rooms, classrooms, and lecture halls; Eliminates cable clutter: Turn your wired HDMI/VGA projector display into a wireless one; Display from any device: Use tablets, smartphones, or laptops to present, collaborate, and share content; 4-to-1 screen distribution: Show four sources at the same time on one screen. Extron TeamWork is designed to work with virtually any classroom or business furniture system, new or currently in use. TeamWork systems are easily tailored to fit specific collaboration requirements, for up to eight users, in three easy steps. The online TeamWork System Builder quickly steps you through the creation of a custom TeamWork system. Choose from a wide range of Extron products to select the switcher, enclosure and "Show Me" cables or Retractors, and IP Link control processor that are best suited for your collaboration environment. There are many Extron products suitable for TeamWork applications. Pre-configured TeamWork system packages, for four to six users, are also available for fast implementation with minimal setup. To start the TeamWork system, simply connect one of the system's "Show Me" control cables to the video output on your device. As soon as an active signal is detected, the display will be powered on. By pressing the "Share" button on your "Show Me" cable, the button lights and the switcher automatically selects the appropriate input. When you’re done, simply disconnect your laptop and walk away. An integrated inactivity timer automatically turns off the display after a predetermined time period. MiniVU, FSR’s newest addition to its HuddleVU collaborative learning line, offers a complete packaged solution that incorporates multi-faceted functionality into elegant form from a compact footprint. MiniVU allows two to four users to share and view their laptops, tablets, and smart phone screens on a main display, delivering an ideal environment for small group study areas or a convenient break out space in large, open classrooms. Available in counter or table height, with a standard or custom finish, MiniVU integrates all the technology necessary for quick start up and intuitive switching. Installation is simple with hardware included and no software or programming required. The KnollExtra Power Cube is a lounge table that does double-duty as a digital charging hub and an analog communications tool. Power Cube brings easy access to power to shared spaces, because everyone needs a place to plug in when they’re on-the-go. With whiteboard writable surfaces on all sides, Power Cube encourages the sharing of ideas, making it great for informal team meeting areas. The clean-lined design fits in with any aesthetic, from the distinctive to progressive. Jupiter Systems’s Canvas CRS-4K is a conference room system in a small, quiet box that enables powerful Canvas collaboration for teams in conference rooms and huddle rooms. Running the Canvas Client, CRS-4K allows teams to share live video, real-time data, documents, application screens, and presentations with remote users in a rich collaborative environment. The CRS-4K supports up to four 1080p HD displays or a single 4K Ultra HD display, allowing even the smallest huddle room to have Canvas on the wall for powerful, collaborative teamwork. The CRS-4K is equipped with Jupiter’s SimpleShare technology, which makes it possible for users without Canvas to share their laptop screens easily and instantly with local and remote Canvas users. With SimpleShare, Jupiter’s WebRTC implementation, any laptop can be a Canvas source without downloading software, connecting cables, or attaching dongles. The CRS-4K supports Canvas 3.0, the latest version of Jupiter’s collaborative visualization software and its new features including a shared voice chat room, Microsoft Lync integration, and support for shared video and audio with SIP-based conferencing systems. A multitouch web-based tablet interface makes previewing video and manipulating canvases easy. Kramer recently added VIA Campus, a wireless VIA solution for education and training, to the VIA family of wireless presentation and collaboration solutions. With VIA Campus, students can connect any laptop or mobile device and present instantly to the main display, view the main display on their screen, edit documents together in real time, and use the main display as a digital whiteboard. Both teachers and students can share any size file and stream full-frame HD video. VIA Campus e-exams feature enables teachers to give interactive, multimedia tests and get immediate feedback. The e-Polling solution lets teachers conduct instant surveys of student knowledge and opinion to help stimulate relevant discussion and debate. This Bring-Your-Own-Device (BYOD) solution also features on-screen collaboration, Mac/PC and iOS/Android mirroring, and third-party apps for remote learning and collaboration. Middle Atlantic’s Hub is a technology-ready, all-in-one furniture solution for collaboration spaces that is designed to maximize equipment storage and cable management. Created for easy integration, Hub is ideal for unified communications and collaboration environments including huddle spaces, active learning spaces, and videoconferencing applications. Each Hub is comprised of a tabletop featuring a Wiremold InteGreat table box providing power and data for easy BYOD integration. These are supported by Middle Atlantic’s TechPed technology pedestal, featuring integrated Lever Lock plates for small device mounting and two Wiremold HDMI cable retractors to facilitate connectivity for anyone at the table. Shipping fully assembled for easy integration, the TechPed also includes 4RU of space with room for additional cable retractors and power distribution with a four-outlet power strip. In addition, Hub includes a wall-mount bracket for flat-panel displays with an additional four-outlet power strip that mounts to the table bracket for connections close to the display. An optional tower, available in black or white, can be used to mount displays directly to the table in a freestanding configuration. Revolabs FLX UC product family of conference phones provides users with a series of standalone devices made to satisfy virtual meeting requirements in offices, huddle rooms, and medium- to large-size conference rooms. The phones feature powerful, high-fidelity audio capabilities that combine premium tweeter and mid-woofer elements, four integrated microphones, and audio technology such as acoustic echo cancellation, wide frequency response, and full duplex support. The cost-effective FLX UC 500 USB speakerphone, users gain higher power than typical USB audio devices, which allows users to easily connect the unit to any PC, Mac, or Chromebook for use with communication applications such as Skype, Microsoft Lync, Vidyo, WebEx, and many others. Steelcase new concept products for the Intelligent Office, a future workplace which integrates technology into places that can enhance human interactions at work and give workers more control over key sources of distractions that impact performance such as noise, interruptions, lighting and temperature control. 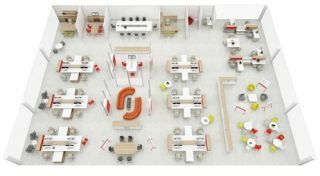 These concepts represent Steelcase’s explorations of how work environments in the future might better address a range of distractions and obstacles at work that leave people feeling overwhelmed and less productive. The concept integrates sensing devices into the work environment that gather and aggregate data and learn over time what people want and need. More Info: http://www.steelcase.com/Cindy Davis is AV Technology magazine's contributing editor.